This Short Update describes a skirmish that took place between the Tatmadaw and the KNLA in February 2019. It took place after three incidents of Tatmadaw soldiers firing artillery shells indiscriminately into civilian villages. The local communities have fled into the forest, and are afraid to return to their homes and plantations. In the first week of February, the Tatmadaw transported soldiers and rations to bases in Lu Thaw Township. On February 1st, 60 Tatmadaw soldiers from LIB #593 were sent to military camps in Sha Law Kyoh area, Hkay Poo village tract. They are still present in the area. On February 4th, at 6 PM, Tatmadaw soldiers transported food rations to their camp in the Sho Kyoh Daw Hkoh area, Saw Muh Plaw village tract. At 7:30 PM, KNLA soldiers led by Bo Pa Leh and a local home guard from Company #1 ambushed two military trucks transporting rations. The KNU prohibits Tatmadaw soldiers from entering into areas under their control without receiving prior permission. This incident was one of a series of skirmishes that occurred between the Tatmadaw and the KNLA in early February in Hpapun District. On February 5th, 2019, Tatmadaw soldiers transported food rations to their temporary army camp in Shoh Hpoh Kyoh area and transported food rations and 216 soldiers to their army bases in Wah Klay Tuh area. The increase in military activities is worrying local communities in Lu Thaw Township, who fear that the increase in troop rotations and food rations could indicate a return to violent conflict. These skirmishes occurred just a few weeks after the Tatmadaw fired artillery shells into civilian villages in Lu Thaw Township. On January 18th, 2019 at 6 PM, the Tatmadaw fired 49 artillery shells in the area surrounding Ta Koo Der village. The units responsible for this are based in the Paw Khay Hkoh and Keh Deh Kyoh army camps, located in the mountains to the west of Ta Koo Der village. The artillery shells hit paddy farms belonging to local villagers in the Daw Hta area. One of the shells killed a buffalo belonging to a local woman, which was worth 16,000 Thai Baht (US $511). On January 19th, 2019 from 5:00 to 6:35 PM, the Tatmadaw fired artillery shells in the area surrounding Ta Koo Der and Kuh Day villages. The responsible units are based in the Paw Khay Hkoh, Keh Deh Kyoh and Kuh Hkoh army camps. They fired into the fields of local villagers. A buffalo belonging to a local farmer was killed by mortar shrapnel. On January 20th, 2019, the same Tatmadaw units fired 40 artillery shells into the area surrounding Ta Koo Der village. The Tatmadaw battalions are unknown, but locals believe they are under the Southern Operation Command (SOC). According to local sources, none of the villagers were injured from the shelling. They fled into the forest for safety. They are afraid to work on their fields or raise their livestock. The villages where the artillery shelling took place are located near a vehicle road the Tatmadaw uses for resupply and troop rotation. The local community was previously displaced when fighting happened between the Tatmadaw and the Karen National Liberation Army (KNLA) in March and April 2018. These skirmishes were sparked by the Tatmadaw building a vehicle road in KNU-controlled territory, leading to the displacement of an estimated 3,000 villagers. 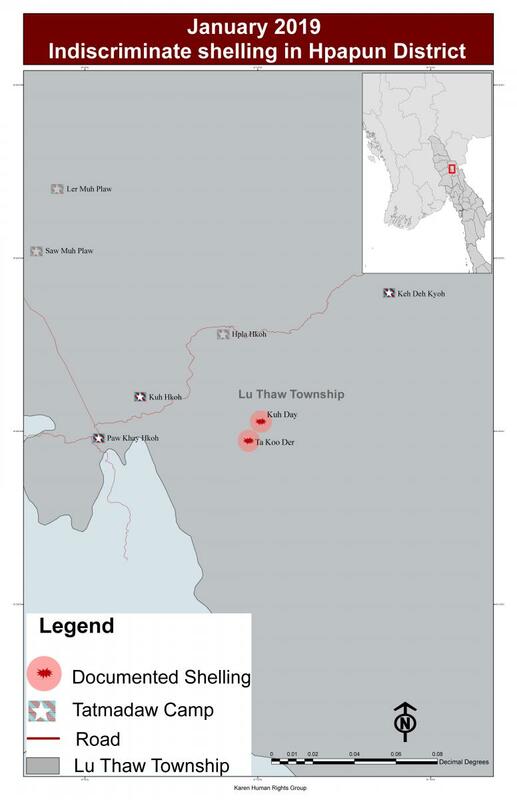 On February 25th 2019, KHRG received updated information about the situation in Ta Koo Der and Saw Mu Plaw villages. Because Tatmadaw shelling has decreased, people have returned to their homes. However, the situation is still tense in that area. Civilians who live close to the Tatmadaw vehicle road continue to have concerns for their safety. This report has been updated to reflect a correction in the number of artillery shells fired on January 18th, 2019. A previous version of this report erroneously cited 91 artillery shells. “Nationwide Ceasefire Agreement”, October 2015. See, “Attacks on villagers, ongoing fighting and displacement in Hpapun and Toungoo districts from January to April 2018”, KHRG, May 2018.